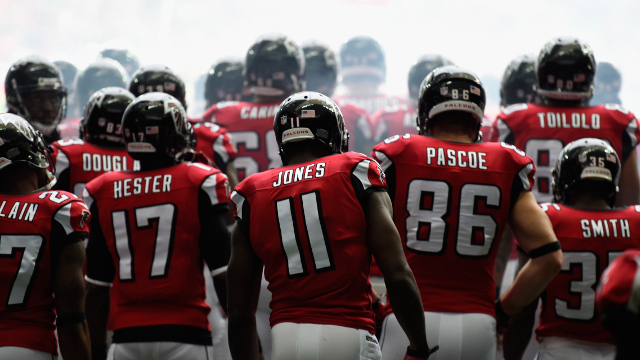 Can the Atlanta Falcons Soar Back Into the Playoffs in 2015? A disappointing 6-10 finish in 2014 led to big changes for the Atlanta Falcons. Most importantly, head coach Mike Smith was dismissed after seven seasons with the team. Smith had some productive seasons as the man in charge, leading the Falcons to double-digit wins and playoff berths in four seasons. However, a second consecutive losing season was too much to overcome and ownership decided a change was in order. The club hired Dan Quinn as the 16th head coach in club history in February. Quinn was a highly-sought after assistant after serving as Defensive Coordinator for the Seattle Seahawks for the past two seasons, and it’s easy to see why the Falcons wanted him. During that time, the 'Hawks were the top defensive unit in the league and appeared in back-to-back Super Bowls. Quinn is a long-time coach at the collegiate and professional levels who could have had his pick of virtually any of the open HC jobs this past year. Seattle lined up in a 4-3 defense under Quinn’s guidance. Atlanta lined up in similar formations in previous seasons before converting to a 3-4 last season. It will be interesting to see if Quinn makes the switch back to the 4-3 or sticks with last year's alignment. Regardless of formation, Quinn is almost guaranteed to improve the team’s defenses. Indications are that Quinn will have final say over the 53-man roster, but that GM Thomas Dimitroff will retain final say over the draft and free agency. Not many NFL coaches have final-say authority over the roster, and the decision to grant it to Quinn can be only viewed as testament to how coveted he was. Joining Smith on the Falcons staff are new defensive coordinator Richard Smith and new offensive coordinator Kyle Shanahan. Smith spent the last four seasons as linebackers coach for the Denver Broncos. Shanahan was most recently offensive coordinator with the Cleveland Browns, and is expected to implement a more balanced offensive attack with a heavier reliance on the run than in past seasons. Matt Ryan returns under center and should be his usual steady self. His numbers may take a bit of a dip with a change in offensive philosophy but a shift to a more balanced attack should benefit the offense as a whole. Julio Jones returns as his top target on offense. The top tier receiver will be joined by veteran Roddy White and the intriguing Leonard Hankerson to round out a solid receiving corps while Jacob Tamme will assume starting Tight End duties. The backfield situation will continue to develop throughout the preseason and probably well into the regular season. Second-year pro Devonta Freeman and rookie Tevin Coleman will battle for time and could ultimately form a two-headed monster at running back. Freeman did not do much in a limited role last season but the new offensive scheme is reportedly a great fit for his skill set. Coleman was an electrifying player at the collegiate level who should have strong upside at the pro level. Add it all up and the Falcons could be in line for a nice bounce back with a new regime in charge. Add in what is one of the league’s easiest projected schedules in 2015 and a run at the playoffs is not out of the question. A division crown may be shooting a little too high, but the team should be in the conversation for a wild card berth.